I spent 5 hours helping my teenager clean out her room last New Year’s Day. Clearly, we know how to party. It was also her birthday week and she wanted a more grown-up space. But we knew we had to clean out what she didn’t need and what didn’t belong to make room for new. We couldn’t believe how much stuff she had collected and held onto. We laughed at the 5th grade school projects and old journals as we put away her dolls. This is a part of life—letting go and getting rid of what doesn’t work (or fit) any longer so we can make room for something better. I want to raise grateful kids, but we live in an entitled world. 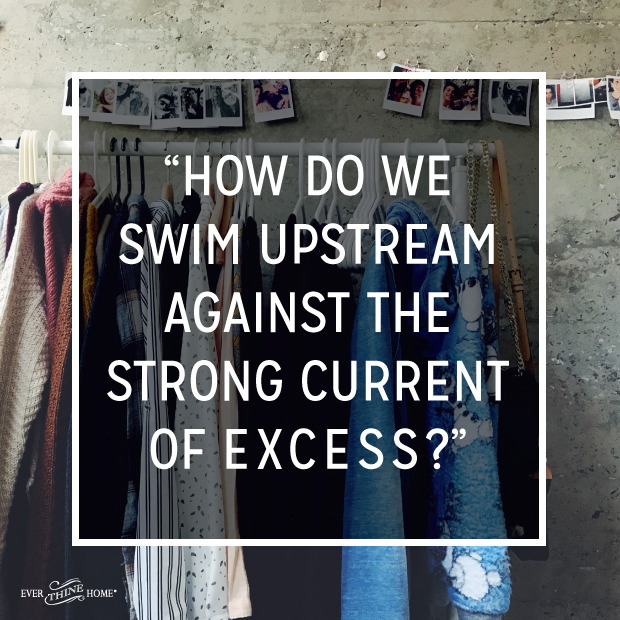 So how do we swim upstream against the strong current of excess? 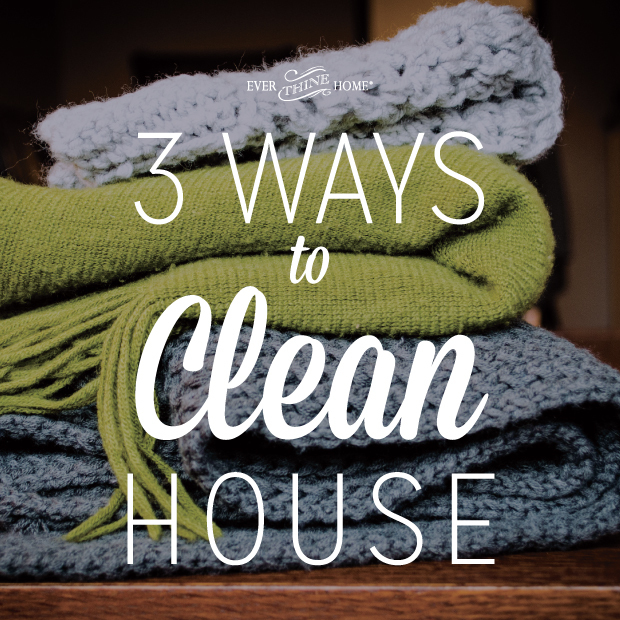 We do the same thing in our parenting that we do in our home when we recognize we have too much stuff. My first two kids are barely two years apart. On our daughter’s fourth birthday, our son was nearly two. I didn’t want him to feel bad that she was getting gifts and he was not (in other words, I didn’t want him to have a tantrum), so I gave him a gift on her birthday. But a couple of months later, she expected one on his birthday. This snowballed into a lot of unnecessary gift-giving for no reason, other than I had guilt and was afraid of fallout. I had created a problem. It’s okay for our kids not to be rewarded all the time. Goody bags at birthday parties are harmless, but when we apply the same mentality to everyday parenting, we create entitlement and unrealistic expectations. It’s okay for our kids to do chores and help with dinner simply because they are a part of the family. I think telling our kids they’ve done a good job when they have is great. It’s the overpraising that comes off as artificial and disingenuous and causes more harm than good. I know I’ve been guilty of saying, “Good job” and “You’re the best!” when their attempt was just average. It’s more helpful to replace constant praise with encouragement. One definition of the word praise suggests that praise glorifies; by comparison, encouragement inspires. I want to inspire my kids to do their best. It’s natural from the beginning of our parenting journey for us to see ourselves as the rescuers and our kids as the rescued. We want to take care of our children. Part of our job is to reassure our kids that we will be there for them, and we are, but the rest of the job requires that we walk away. Kids will continue to let us rescue them if we continue to rush to their side. When one of my kids was learning responsibility, I realized the best way for them to remember their lunch was for me not to bring it on the third day in a row they forgot it. Ouch. But the lesson was quickly learned. As hard as it may be, we have to let our kids fail. It’s the only way they truly learn how to succeed. Self-sufficiency is as natural as those first baby steps. Don’t be afraid to let them take these steps, and when they fall or fail (they will do both), it’s okay to let them stand back up by themselves. It starts with saying no and following through, and then backing away and letting them learn how to navigate the world on their own. Renovating and redirecting can be a slow hard process that takes time and consistency. Don’t give up! You’ll love the space your intentional parenting creates. And you’ll love the cleaner house. Kristen Welch is a native Texan, a wife and mom. She began blogging about her life on wearethatfamily.com nearly a decade ago. In 2010, she traveled with Compassion International to Kenya on a blogging trip to write about poverty in a huge slum. That experience turned her world upside down, and as a result, she and her family founded a non-profit called Mercy House. The organization funds maternity centers for pregnant teens living in extreme poverty and manages Fair Trade Friday, a monthly subscription club that allows thousands of women in America to support impoverished women around the globe by purchasing the fairly traded product they create. Kristen’s newest book is Raising Grateful Kids in an Entitled World: How One Family Learned That Saying No Can Lead to Life’s Biggest Yes. If you’d like to hear more from Kristen, tune in to FamilyLife Today where she talks about addressing entitlement and cultivating gratitude. How I agree with everything said. We told our son there is a consequence to every action & choice made. He was raised to accept the consequences of a bad decision & enjoy it when he made good decisions. He is 34 today & I can say he turned out to be a wonderfull man. I want to thank you for speaking truth and confirming what my husband has said to me so many times. We shouldn’t be afraid to let them fail. Encourage them always. I am a pediatrician and this blog on praise vs inspire our kids is right on!